Sat behind a pillar in the Upper Gwladys (for £40 I might add), my view on Saturday’s game was only partially obstructed (apparently) and therefore I have a number of reflections on our performance, now that the dust has settled and perhaps some of the hype has died down. We won. We were superb in the second half of the second half, we were outplayed for long periods in the first half and could have been at least 3 down after 30 minutes. But we weren’t. And by half time we were actually one up, and so it remained, despite Chelsea having a number of decent chances, none of which were obstructed by my pillar, but were instead obstructed by strong defensive work and the side netting. You can probably tell that I am delighted we won, but let’s also be clear, on possession and chances alone, we perhaps didn’t deserve to. But such is the way of football, such was much of our season last year, and such was our lack of clinical finishing to turn possession in to wins at Norwich and Cardiff and home to WBA. This is NOT a glass half empty perspective. My cup is actually so full of pride after Saturday, I sang all the way home to Nottingham, and I couldn’t sleep all night. But I do think a bit of realism, actually as shown by the likes of Martinez, might be helpful. Overall, what impressed me was that we used the hoof-ball a bit more often this week, with Howard or Jags pumping it up to the surprisingly jumpy Naismith who won every ball against Cole, so much a problem that Chelsea moved Mikel over to mark him. I suspect Howard may not be trying too much intricate passing in future, after his debut as sweeper nearly ended in disaster. By the nature of the way the opposition lined up and played more going forward, our passing game looked good, as this week we didn’t have two banks of five lined up in front of us (actually need to check the video, not sure Cardiff didn’t have 18 players on the pitch). So we need to adapt a little bit and not play the way everyone expects us to play, and we did that on Saturday with pleasing results. But we have to move more, there were times when a player on the ball looks up, and the players ahead of him are stationary, and so the ball ends up going backwards or sideways. Or in the case of Osman, to the feet of an opposition player, but more on him later. Defensively, anyone with our back four in their Fantasy League team will be overjoyed with the start we have made, only two goals conceded, and both of those slightly freaky. But let’s not be complacent, Eto’o was allowed too much space, Torres had a good chance when again in too much space, and pacy intricate dribblers like Shirley (i think that was his name), Mata and Hazard, really posed us problems. Thankfully, not many teams we will face this year have such an abundance of ball players as Chelsea, but Ben Arfa will be licking his lips at the prospect of so much space at GP in 2 weeks’ time. We have to close down quicker, we can’t allow players like that to run at us – even Luiz ran at us unchallenged several times, even if he did get a nosebleed the higher up the pitch he got. Barry was immense. I can’t imagine anyone in our squad playing like that, not even Gibson, fantastic though I think he is. Barry was just one reason why the Fantasy League defenders got another clean sheet and he showed his class within the first 5 minutes – two tackles, two wide balls and one chested pass, and he was off and running (but not very far as his legs are not quite what they were!). I loved watching him, and can’t wait to see more of him. How RM will fit both him and Gibbo in the team is a mystery, and don’t forget Ginger Jim who didn’t look out-of-place in his 20 minute run out. Lovely problems to have. Seamus, oh Seamus….what a game. Not picked out by many observers, but I thought he was great, with lung-bursting runs up and down the pitch, and his defending has improved Wonga style (2567%) in 18 months. Whenever Hazard came wide, Seamus stuck to him like glue, and even tricky Oscar got no change from the limpet-like attentions of our little right back. Mind you, given Ireland’s performance, Oscar might be the closet Seamus gets to Brazil in the foreseeable future (insert your own Brazilian jokes here). Baines, what a legend. To a man, woman and child, the Gwladys, upper and lower, and the Paddock, rose to give him a standing ovation when he came to take corners. If that doesn’t persuade him to stay I don’t know what will. His marauding forward was seen much less, I think at RM’s instruction, but also possibly because of his missing sidekick Pienaar. A good game from Baines without being exceptional I think. Barkley – ok, the praise that is being heaped on him is justifiable, and I’ve been watching him come through the ranks since he was about 14 and have always said he’s the real deal. There were some excellent forward runs, running at pace and beating players puts the fear of god into the opposition, but don’t beat 3 people and improve your EPL stats and miss the simple wide ball to Mirallas as he did on more than one occasion, unless there was a Chelsea player marking Kevin, obscured by my friend the pillar (have I mentioned the pillar?). RM is right to big him up, as he’s clearly a confidence player, a fact that DM didn’t seem to understand, but don’t let the new England international believe his own hype, and remind him when to take people on and release others, and he will get even better. For me, he is an absolute hero, and I can’t wait to see more of him as he cements his place and develops further. Leon Marmite, however, is at the other end of his career. Leon looked woefully short of confidence on Saturday, and as you either love him or hate him, it did nothing except to raise doubts amongst his considerable legion of supporters. I think Leon can be wonderful in this new set up, he has always been the player who looks comfortable on the ball, looks for the pass, finds a player, and used to only lose it when trying to do too much. On Saturday, despite what Ken at Toffee Web said in his piece, he gave the ball away far too often, and that is just not like Ossie. He too is a confidence player – do you rest him and risk the confidence ebbing away still further? Another midfield conundrum. 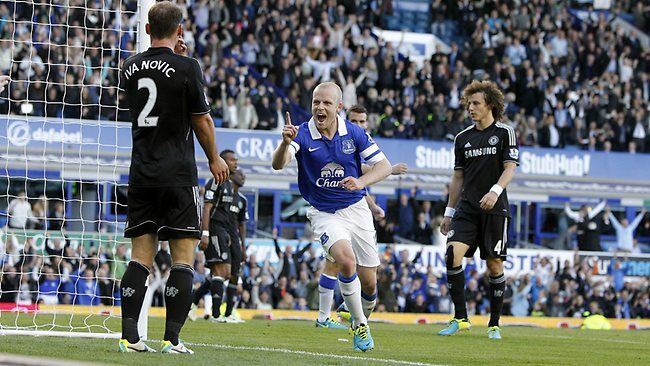 Naismith – Saturday demonstrated to me that Goodison probably want this under-achieving underdog, to achieve and be top dog, almost more than any other player. We love his fight, we love the work rate, again up and down the pitch, and it’s just that final pass that too often goes to the wrong feet. Not good enough for the EPL some say, a definite Championship player they say – well, they may be right, and I’ve said it myself occasionally, but I honestly believe that Saturday’s performance topped off by his opportunistic 30 yard screamer (sorry, that pillar again) gives him the platform to succeed, and that is what RM has been saying since Saturday’s game. With Pienaar out for a little while, put your arm around his shoulder Roberto, tell him he’s playing against WHU, Fulham and the Barcodes, and lets see what he can really do – and if not, then just maybe he does become a bench warmer, or offloaded in January. Harsh, but we have talented players coming through and on the bench already. Mirallas and Jelavic can be bracketed together for me. Lots of tireless running, with Kevin in particular looking sharper than at Cardiff where he was dreadful. In fact, he looked a real threat when played up front and top, so that gives us a real alternative to take in to games as well as our apparent glut of strikers. When I say strikers, I do include Jelavic. Another good team performance on Saturday, brilliant to get the header back across goal for Naismith, and the early chance if headed just a foot further to the right would have beaten the wrong footed Cech. It will come Nikica, it will come, you don’t score goals of the quality you did when you first came here without being a very good striker, so it will come, it will come. I hope. So, after all that, I came away elated, I bought every Sunday paper for a change, and waking up on Monday is great again! We played well, we won, we grafted as well as played some pretty stuff, and you can see that we are still a work-in-progress, but great progress at that. I am so excited by the prospects, so excited by the options that Martinez has at his disposal, so excited about a Monday night under the lights against Newcastle, so excited about being reunited with my friendly pillar at the Theatre of Obstructed Views. – Heitinga playing with the small kids at half time rather than knocking it about with the other subs. Class mate, class. – surprised to see Gueye on the subs bench – anyone know how he’s been playing in the U21s? – Torres or Lukaku? I think we got the best deal. Lynch me if you want, but I think it is sad how a brilliant striker has seemingly lost it completely.